1. 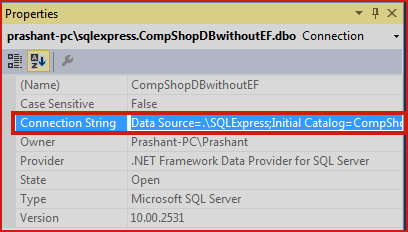 How to Access Database and Tables using Model without Entity Framework 6? 2. 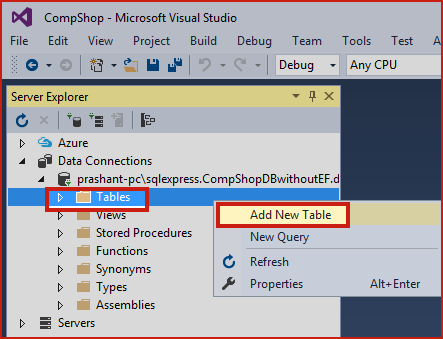 How to Insert, Update and Delete from Tables without Entity Framework? As I mentioned earlier, that Entity Framework is a very powerful tool for database management that allows you to insert, update and delete in the database easily but it is very heavy and limits developer control. Without Entity Framework, you have all the things in your hand and have complete control on your code. In this chapter, I will tell you how can you communicate with the database and Insert, Update and Delete record without using Entity Framework. However, In the next chapter, I will teach you the same thing but using Entity Framework. 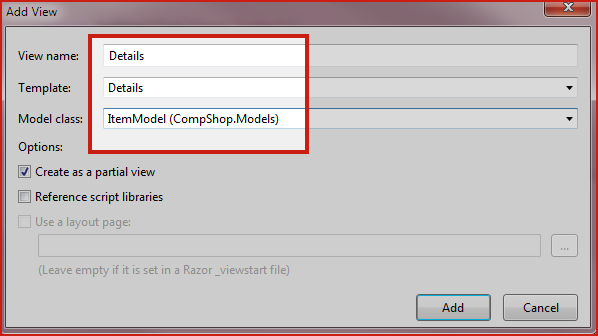 In the previous chapter, you learned how to add a Model and access data in Views. Let’s move to more advanced topic now. I have created already a Project CompShop earlier. 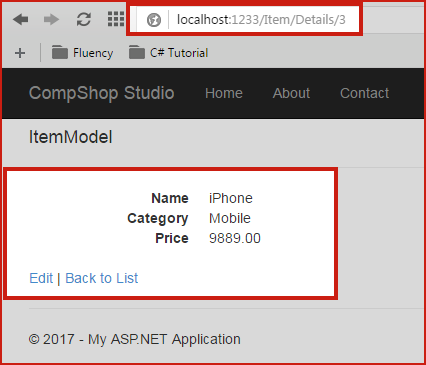 If you haven't created or landed first time on this page then don't worry and Create a New ASP.NET MVC 5 Project in Visual Studio now. I tried to make each chapter complete and independent so you can start right now from this chapter. Now, we will create a Database and a Table. This table will be used for storing, editing and deleting records. 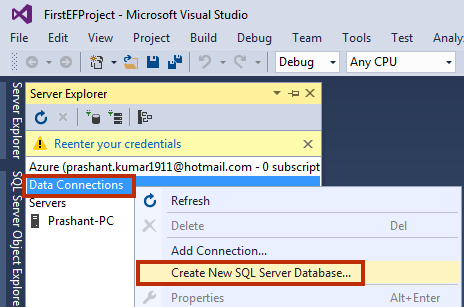 Either you can create database in SQL Server Management Studio or Visual Studio Server Explorer. Here, I will create database and table in Visual Studio Server Explorer. Here are the complete steps. 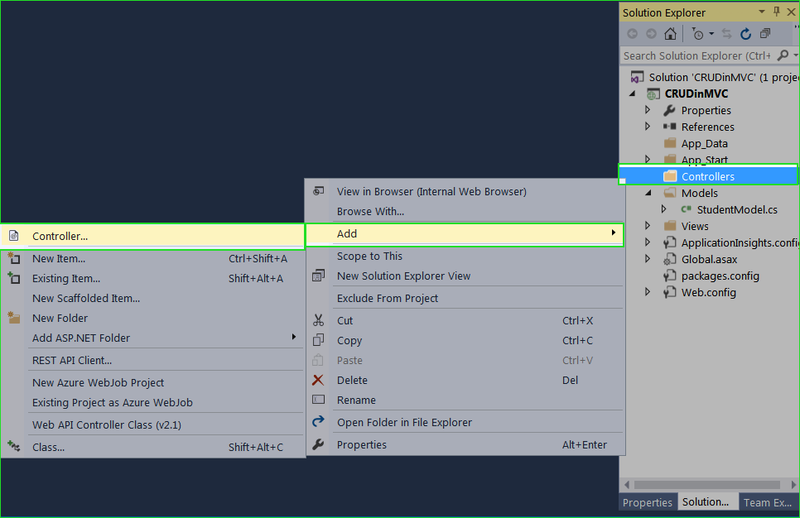 Step 1: Open Server Explorer in Visual Studio. Go to View Server Explorer. 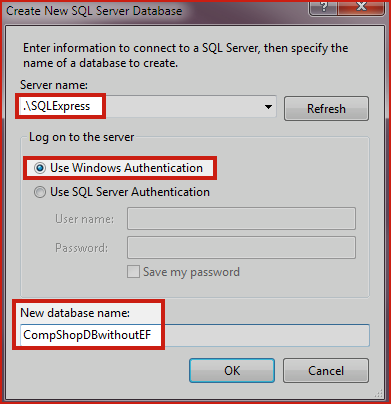 Step 3: Fill Server name as .\SQLExpress and Database name as CompShopDBwithoutEF and click OK. 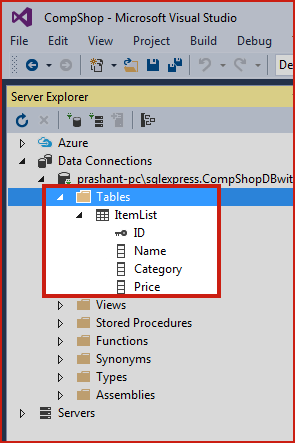 Step 1: Expand your Database in Server Explorer and Right Click on Table Add New Table. 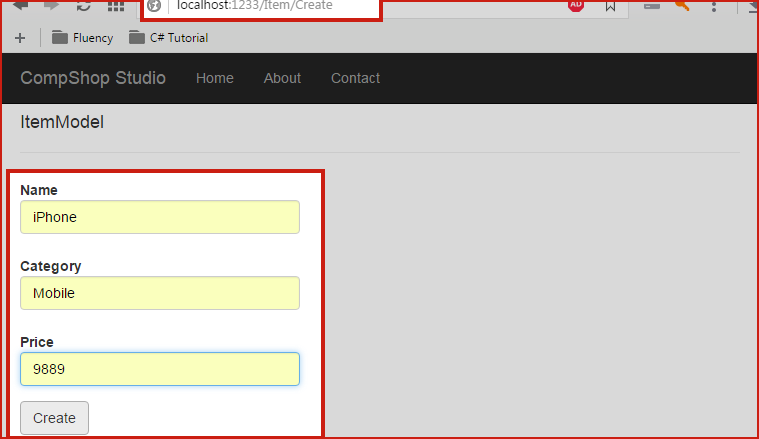 Step 2: Now design table as follows or execute following script to add table ItemList in the database. Step 3: Now your Tables are created. You can see it in Server Explorer. 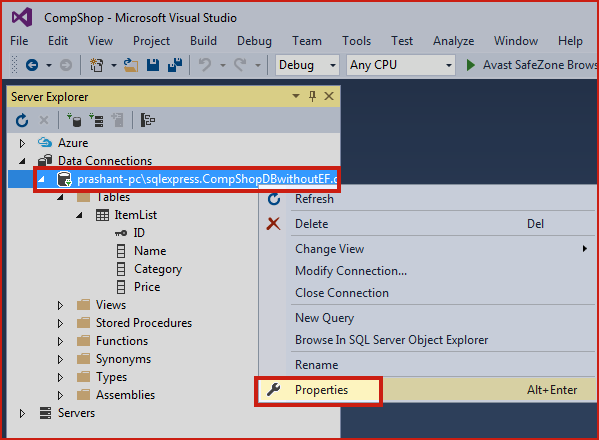 Step 1: Right Click on your Database Connection in Server Explorer and Select Properties. Step 2: You will find Connection String in Properties window. 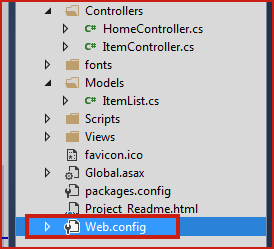 Copy connection string and add it in web.config file. Step 3: Open Root Web.config file and add connection string before </Configuration> as follow. Now, the next step is to creating model for ItemList Table. Here is the steps. Step 2: Add the following mapping code in it. Here, I am going to create a class that will handle all the database related query as insert, update and delete. Model will use this class to make a connection with database and process record. Step 1: Create an ItemDBHandler.cs class in Model folder. 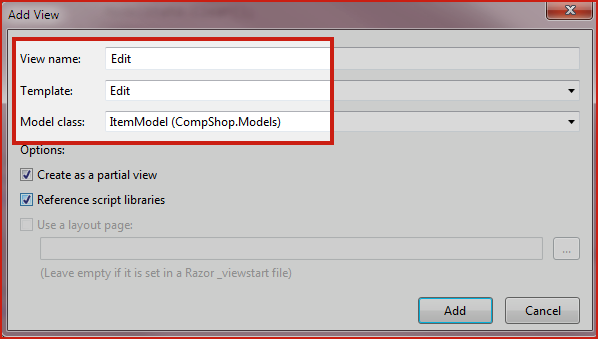 Right click on Model Add Class. Add the following code in ItemDBHandler.cs class. These are the very basic ADO.NET code and you can understand it easily. If you are having a problem in ADO.NET then you can take a quick look or learn complete ADO.NET here. 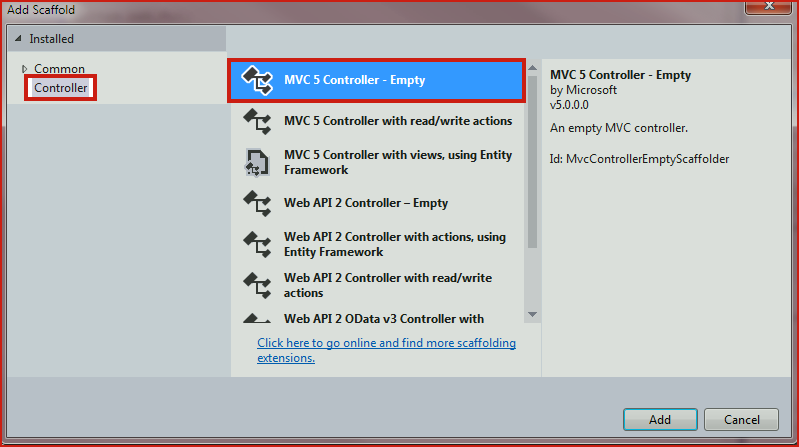 Step 2: Create MVC 5 Controller - Empty and click Add button. Step 3: Give controller name : ItemController and click Add. Honestly, nothing special in this code. I have used Model class ItemModel to access data or store data. ItemModel class uses ItemDBHandler class for processing the database related job. I have written all the database related code in ItemDBHandler.cs class. 7. Add View Pages from Controller’s Action Method. Now, this time is to adding view pages for all the action methods from ItemController. It is very easy, just look how. 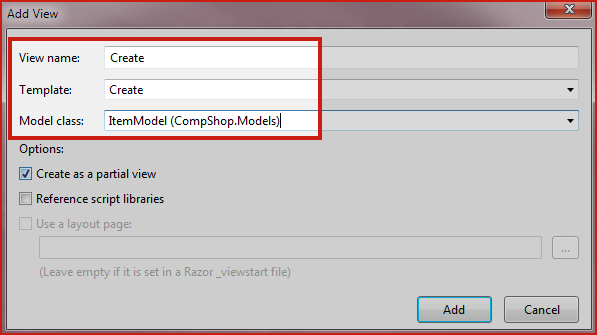 Step 2: Add View Dialog box will appear. Fill details as in this picture and click to Add button. 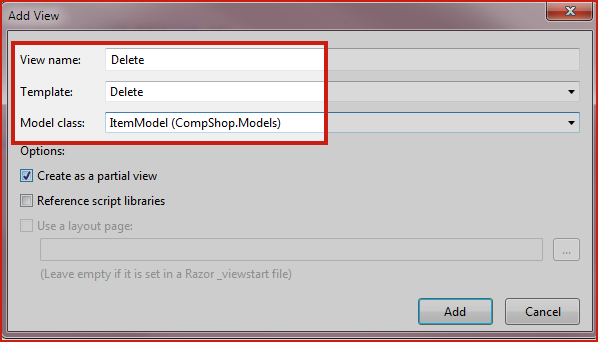 Step 3: Using the same process Add View for Create(), Edit(), Delete() and Details() action method. In this chapter, you learned how can you use Model for Inserting, Updating and Deleting record from database table. You must make a Database Handler class along with Model because Model depends on this handler class. It is known as best practices and when you develop your project systematically. It would be easier to understand your code later. When Controllers needs any information from the database it looks into model and model call DB Handler class and gather information and then return value to the controller. I think this chapter is complete explanatory and you have understood it clearly. This chapter uses clean ADO.NET Code to connect to Database. In the next chapter, you will make this same project again but this time I will introduce you to Entity Framework 6. 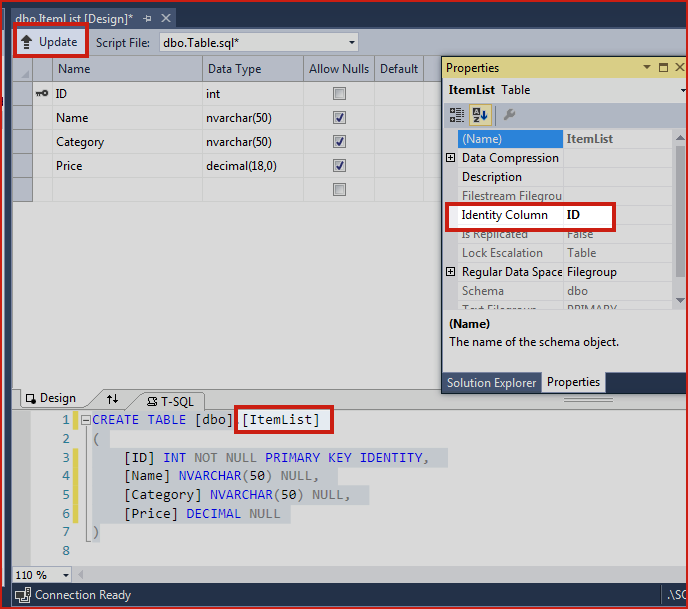 You will see that how Entity Framework makes Database Part easier. 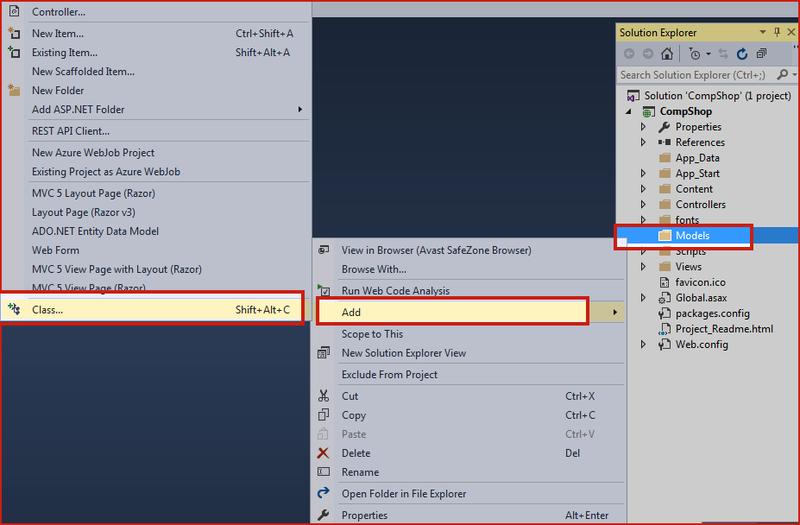 In the next chapter, you will learn Insert, Update and Delete in ASP.NET MVC 5 using Entity Framework 6.